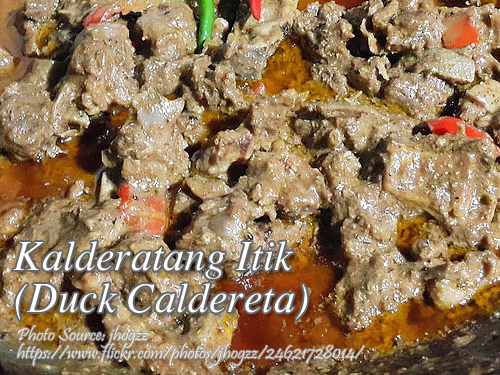 Next to the favorite Filipino duck recipes is the kalderatang itik or duck calderata. The duck used in this recipe is the native duck in the Philippines called “itik” which is brown with black spots and smaller than the big white variety which is called “pato”. To cook this dish you have to stew the duck in tomato sauce, liver spread, bread crumbs and spices like garlic, onion and chili. There is an extra step before cooking the duck into a stew. You have fry it first until slightly brown. This is cooking method is called braising. This method will make a more savory kalderetang itik as it will release the flavor of the meat by frying or browning it first. The duck used in this recipe is the native duck in the Philippines called "itik" which is brown with black spots and smaller than the big white variety which is called "pato". Fry the chopped duck until slightly brown in corn oil. After frying set aside. Use the oil for sautéing. Sauté the garlic and onion until medium brown then pour in the 2 cups of dissolved bullions cube. Simmer until the meat is tender. Add water if necessary to avoid drying up. Then add the liver spread and tomato sauce. Then add the chili pepper. If the mixture is cook already, add the bread crumbs, salt and MSG to taste. Your kalderetang itik seems to be so good! I’ve always loved Filipino dishes. I always love ducks and I will definitely be trying your recipe! Thank you for sharing. Hi Joy! I love kalderetang itik too and I’m going to cook it tomorrow.